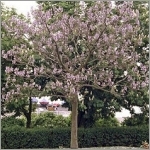 Paulownia tomentosa, also known as Royal Paulownia, Foxglove tree, China Princess tree, or Empress tree, is a medium sized deciduous tree that may reach 30-60 feet in height. It is found in 25 states in the eastern U.S., from Maine to Texas. Princess tree is an aggressive ornamental tree that grows rapidly in disturbed natural areas. It can reach 8 feet in two years from seed. Its ability to sprout prolifically from adventitious buds on stems and roots allows it to survive fire, cutting, and even bulldozing in construction areas. 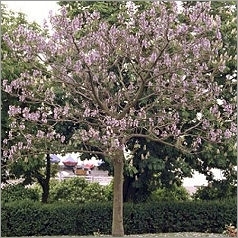 The perfect flowers of Royal Paulownia are borne in terminal panicles up to 25 cm long in April and May. They are violet or blue, and their appearance before the leaves emerge is quite striking. The tubular purple corolla is 4-6 cm long, resembling a Foxglove flower. The bark is rough, gray-brown, and interlaced with shiny, smooth areas. Stems are olive-brown to dark brown and hairy. It requires pruning to develop strong structure. Leaves are large, 4-8 inches, broadly oval to heart-shaped, or sometimes shallowly three-lobed, and noticeably hairy on the lower leaf surfaces. They are arranged in pairs along the stem. There is no Fall color. The fruit is a dry brown capsule, about 30 to 45 mm long, with four compartments that may contain several thousand tiny winged seeds. Capsules mature in Autumn when they open to release the seeds and then remain attached all Winter.